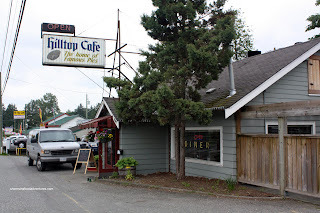 Hilltop Cafe. What? Yes, this little ol' unassuming diner out on Fraser Highway was an intended food adventure. Why? Well, there are several reasons. First, it is a diner. 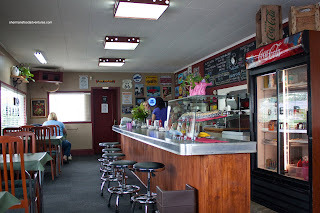 I love diners and this was is an actual diner which has been around for 65 years (however, it just changed hands recently). So the prices are good and the food is honest. Second, it is out in Langley. For me, I think good food can be found anywhere and Langley gets no foodie love. 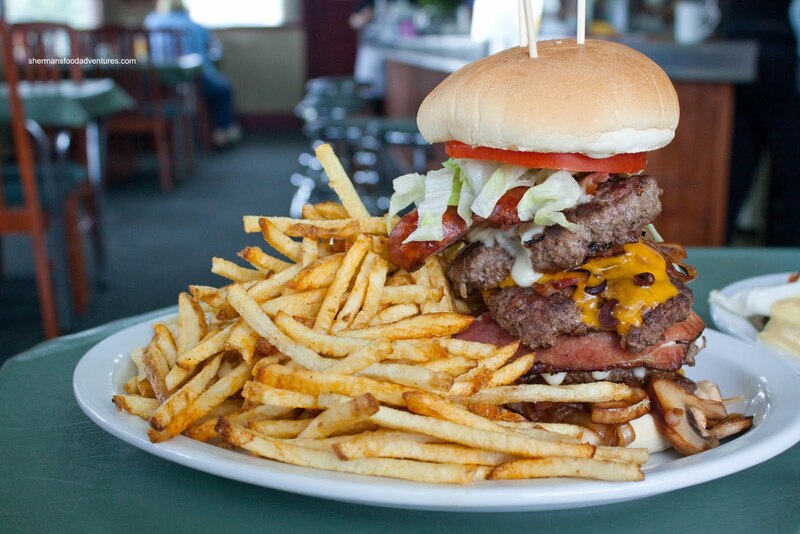 Third, they have something known affectionately as the Everest Burger. If climbing the mountain is considered tough, ea ting this burger may test ones' will, desire and intestinal fortitude. It's $20.00 of pure gluttony. Ah zut! It was not meant to be... 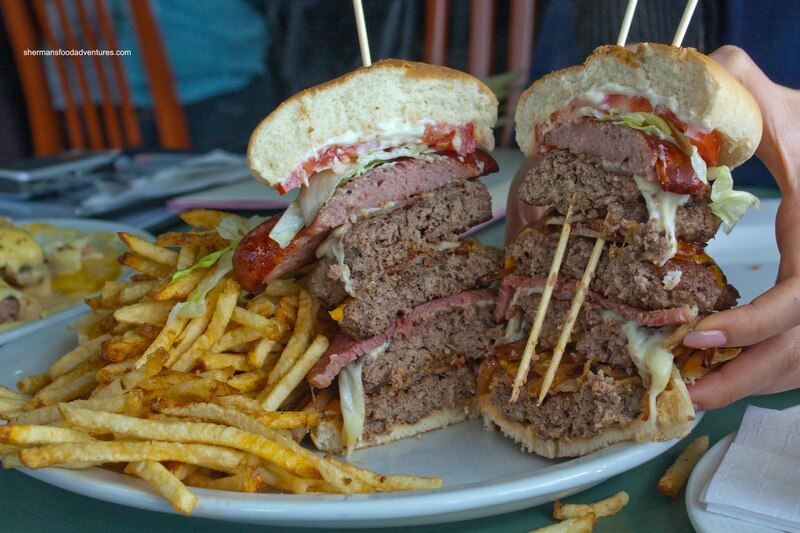 They can't do the Everest Burger during proper lunch hours because it takes up the entire grill. It is only available during non-peak hours. That only means one thing. I need to make the trek out here again just for that! So a bit dejected, I had to settle on the Chili Burger instead. With 2 large handmade beef patties smothered in obscene amount of chili and served open-faced, this was a mountain of fo od in itself. The beef patty was very meaty; yet on the drier side. 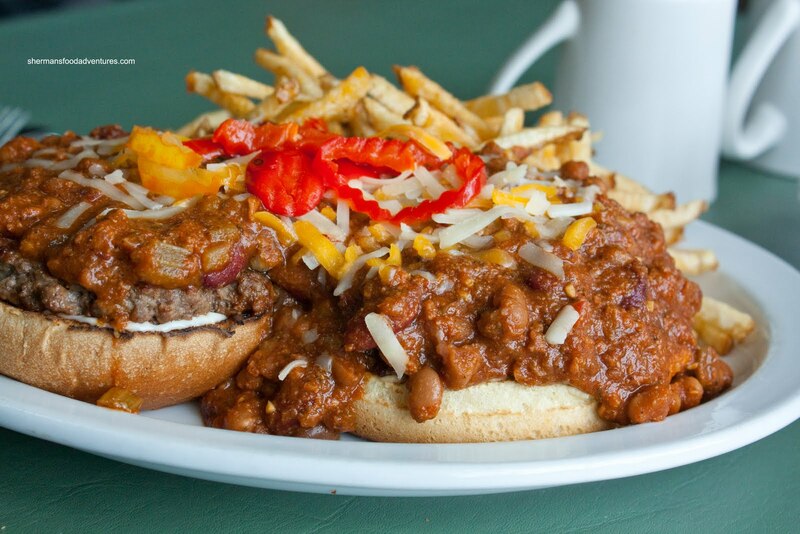 However, the large amount of chili helped moisten the entire burger. As for the chili itself, it was hearty and quite mild. The banana peppers on top added a kick to it though. The fresh cut fries were thin and very crispy. Not much in the way of potato texture left; but I liked them nonetheless. Hot Mama had the Classic Burger and as evidenced in the picture, all of the ingredients from the thick sliced tomato to the grilled onions were fresh and top-notch. The warm bun was soft while strong enough to stand up to the filling. She quite enj oyed her food and thought it was reasonably-priced. 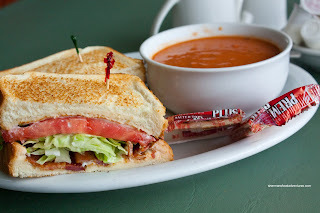 Ma went for the blue plate special which consisted of a BLT and choice of soup. The sandwich was solid. The toast was perfect while the ingredients were similarly as good as the burger. As simple as it is, everything was there: thick fresh-cut tomato, fresh crisp lettuce and crispy bacon. The side of tomato soup was creamy and well-balanced. Not too tart, not too sweet nor too salty. Whenever there is Poutine on the menu, it is a given we'll try it and it looked promising when it arrived. The gravy was flavourful and just the right consistency. The "cheese curds" were not exactly so; but I give it to them they did not use shredded mozzarella. 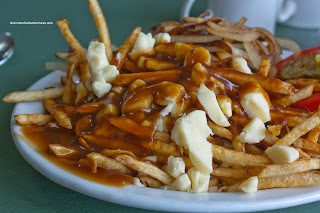 Although we loved the crispy thin fries on their own, they did not exactly work in the poutine. A thicker cut fry that could soak up the gravy a bit more would've been texturally more pleasing. Another sandwich at our table was the Clubhouse. 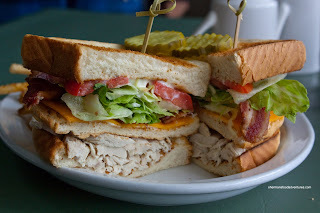 Do you know what irks me the most about some clubhouse sandwiches? If you answered chicken deli meat, you get a gold star! As you can clearly see, the chicken meat is real, plentiful and house made. Add in real cheddar, crisp lettuce, the same fresh tomato and perfectly toasted bread, we have a solid clubhouse. Now afterwards, we really couldn't leave without pie... It does say "the home of famous pies". Well, then again, we have places saying they have the "best coffee" and "best pizza" as well. Usually, there is usually as much truth in those statements as proclaiming Richmond has the "best drivers"... But hey, the pie is decent here. Ma had the Peach Pie a la mode. The crust was really flaky and somewhat moist. I would've preferred for it to be little drier; but I'm being picky here. The pie was pretty solid, not too sweet or wet either. The ice cream was fantastic being hard and creamy. However, the Banana Cream Pie was even better. I'm normally not fond of anything banana in a dessert; but this one was pretty good. The crust on this one was drier (due to filling not being baked with the crust) while the filling was very flavourful and sweet (maybe a touch too sweet). We particularly liked the layer of bananas at the bottom. Now, you probably would've guessed that I was pretty choked that I didn't get a chance to try the Everest Burger. So it was only fitting that I made the trek out to Hilltop again. To tackle this burger monstrosity, I needed someone that loves meat and had a big appetite - Mijune. So what does $20.00 get you in a burger? Try 4-5oz beef patties, baked ham, cheddar cheese, mozza cheese, bacon, farmer's sausage, sauteed mushrooms & onions, lettuce, tomato, pickle and mayo served with a mound of fresh cut fries. So let's cut to the chase here. This is what you call a novelty item. People will order this just for the shock value; rather than really wanting to put their heart and stomach through torture. With that being said, there were some really good components here at work. First, the fries were even better than last time. They were very crisp and fresh-tasting. As for the burger itself, it is definitely a fork & knifer. The patties were homemade and very meaty. They weren't particularly moist or juicy; but they weren't incredibly dry either. I really enjoyed the farmer's sausage. It was meaty, easy on the fat and flavourful without being salty. On the other hand, the bacon could've been more crisp. Of course we couldn't only have one item, despite its size. So we also tried the Sausage Benny. 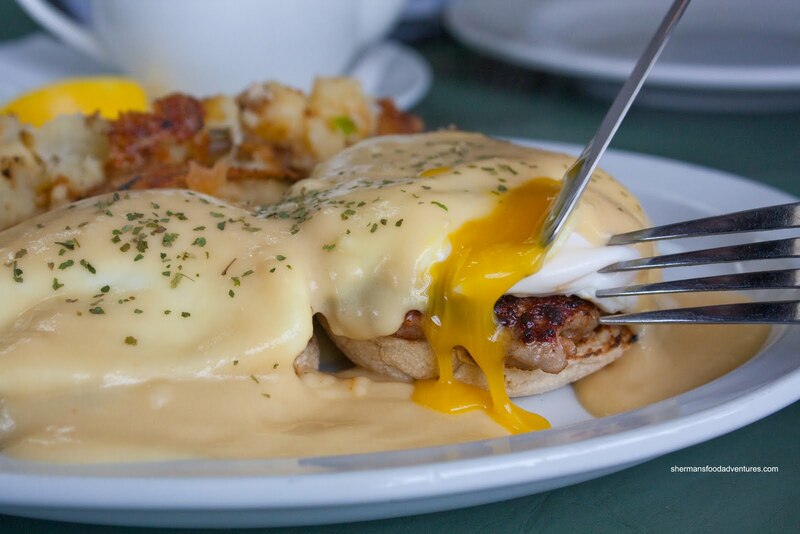 Essentially a classic eggs benny with the substitution of housemade sausage, we found this to be quite good. The eggs were poached perfectly while the sausage was meaty, not fatty and easy on the seasoning. I found the Hollandaise to be rather sweet and lacking in lemon; but it was still okay. Believe it or not the hashbrowns were the star of this plate. It consisted of smashed potatoes which had been panfried until crispy. So there were parts that resembled mash potatoe s intermingled with chunks of whole potatoes. They were well-seasoned which made them some of the best non-typical hashbrowns I've had in awhile. Of course a meal with Mijune would not be complete without dessert. Thus, we did the pie thing again. 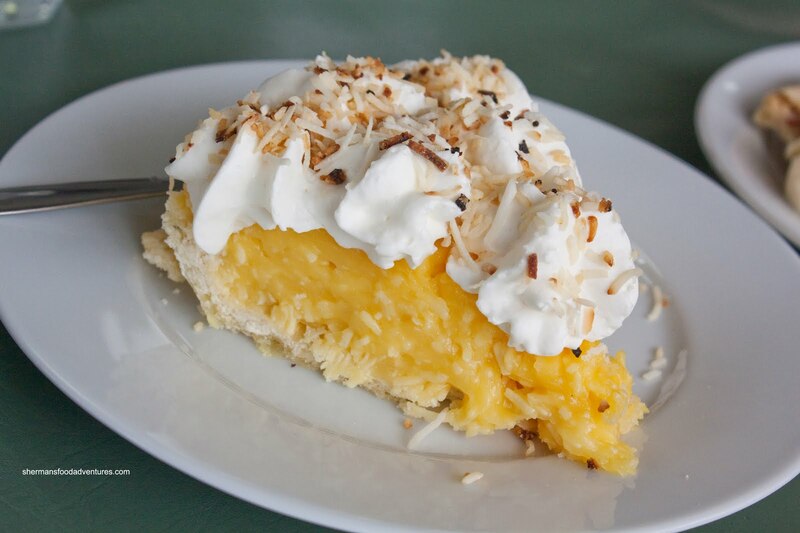 This time, we shared a slice of Coconut Cream Pie. It is basically the same as the banana cream pie except with coconut. Thus, it was pretty solid with tonnes of coconut in and on top of the pie. I would've liked some of the toasted slivers to be drier to give some crunch. Once again, the filling was good; yet really sweet. Now one slice of pie would not be enough right? 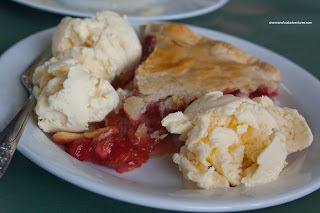 So enter the second slice being the Strawberry-Rhubarb Pie a la mode. Again, it came with the fantastic hard vanilla ice cream. We inquired about the brand and it turns out they use Mountain Dairy out of Abbotsford. It was really good! Anyways, the pie filling was quite tart. 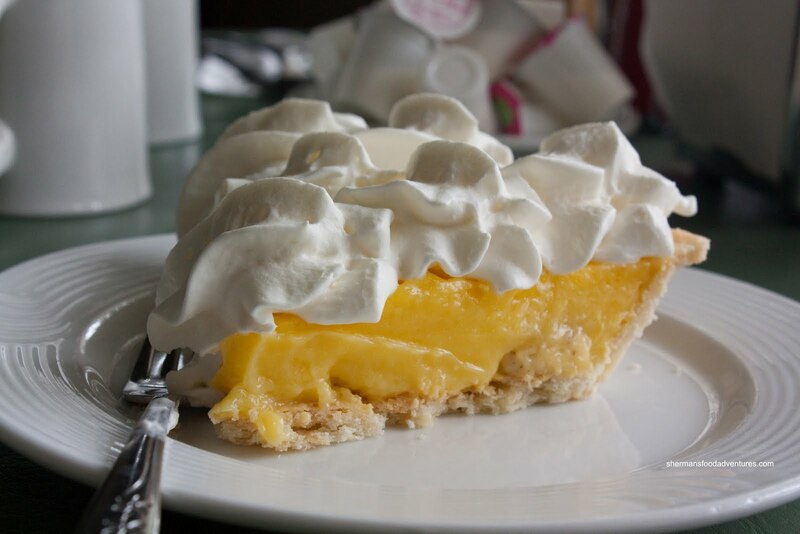 No matter, I like it tart, so it suited me just fine. In fact, there was more filling than crust. The crust was almost an afterthought, which again, suited me just fine because I like filling more than crust. About that crust... Just like the peach pie, the crust was wetter than I would've liked; but it's forgivable due to the amount of filling. Okay, after 2 visits, it is clear to me that the Hilltop Cafe has character. 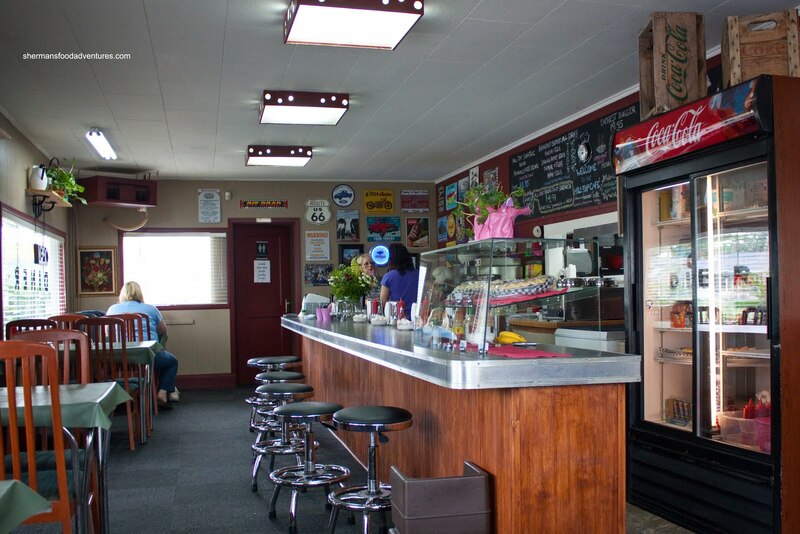 From the staff to the decor down to the food, it is not just your run-of-the-mill diner wannabees. This is a full-fledged diner. 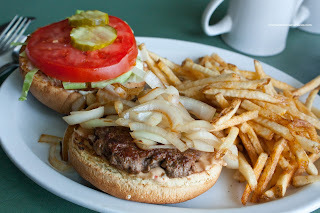 Of course it is located pretty far out in Langley; but if you are in the neighbourhood, it is a great place to grab a bite to eat (or a large one if you go for the Everest). Wow, Sir Edmund Hillary would have been proud of you regardless ! Haven't been to Hilltop in ages, good to see they're still around. Love these cozy downhome places. Okay the chili looks really good, but I take it the pulled pork chili and Estrella's chili was much better? The banana cream pie looks like the coconut cream pie. I think we feel differently about the pies. 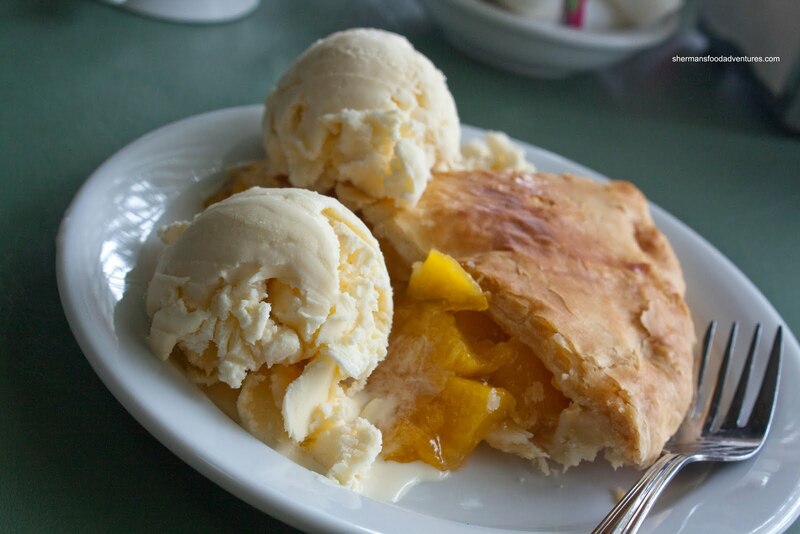 But the peach pie looks good! The BLT looks good too! @LR You should return. The ppl there are so nice! @FMF Hey, join me anytime for food!